The team at Bannochie Builders, Inc. can help you to open your mind to possibilities for your unfinished basement. With high-end upgrades a basement can go from a cluttered storage space to something that looks like it belongs on the main floor of your Bloomington, MN home. 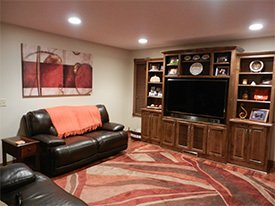 Our Professional Remodelers can work wonders by adding Comfort, Function and Class to any basement. The most important aspects of remodeling an unfinished basement are Waterproofing and Insulation. It takes an experienced Professional Remodeler to know all the ins and outs of making a Minnesota basement fully functional. For your basement to be comfortable all year it has to be able to handle winter cold, spring rains, summer heat and humidity and autumn wind. Basement Waterproofing is extremely important for having a functional finished basement. Our skilled professionals will do a complete evaluation to make sure that the foundation is waterproofed. We will make any necessary repairs to prevent water leakage that can damage your beautiful new space. Proper Basement Insulation ensures that your new living space will be comfortable in every season of the year. We use top rated materials that are very energy efficient and will prevent condensation issues. Bannochie Builders, Inc. is the perfect choice to handle your Basement Finishing endeavors. We have a team of highly skilled Professional Remodelers that approach an unfinished basement with delight. We can often see the hidden potential that Bloomington, MN homeowners overlook in their own basements. Let us show you how we can transform your basement into a comfortable space with Proper Insulation and Waterproofing. Contact us today for a Free Estimate on Basement Finishing. This entry was posted	on Tuesday, January 20th, 2015 at 8:55 pm	and is filed under Home Remodeling. You can follow any responses to this entry through the RSS 2.0 feed. You can leave a response, or trackback from your own site.